Over the course of the past two years, TorqueNews has worked with the members of the SRT Hellcat & Demon Group on Facebook to choose the Hellcat of the Month. The group of nearly 17,000 members are asked to nominate five Hellcat cars that are owned by active members of the online community. Once those five Hellcat cars are chosen, the members are asked to vote on their favorite car of the five in the running. For the month of March 2018, we focused on the Hellcat Challenger, alternating from one month to the next. 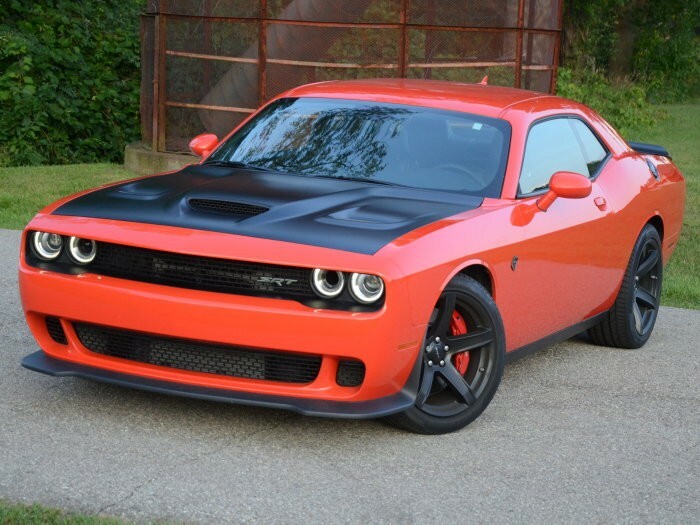 Of the five supercharged Mopar muscle cars nominated by the community, my Go Mango 2017 Hellcat Challenger was chosen by the community as the winner for the third month of 2018. I won with about 41% of the votes while the 9-second Hellcat of Jon Sipple (who has been featured here on TN in the past for his drag strip records) was second with 27% of the votes. In most cases, after the community picks their favorite Hellcat of the five nominated, I reach out to the owner for their story, but since I am the owner of this gorgeous Mopar machine, here is the story of my 2017 Dodge Challenger SRT Hellcat. As an automotive journalist, I am fortunate enough to have been a part of testing the Hellcat cars on multiple occasions. I have attended Challenger and Charger drive events in a few different states including the Bondurant racing school. I have also had multiple Hellcat test cars for a week at a time for new car reviews. Altogether over the course of the past 4 years, I have made countless laps on various road courses, I have made dozens of drag strip passes and I have run up thousands of road miles on different Hellcat Challengers and Chargers and I loved every minute of it. However, I never thought that I would own one of these beautiful machines. While driving the Hellcat Challenger is a remarkable experience, I am far too frugal to ever spend $70,000 on a car. My wife Amanda and I would talk about getting one someday, going over the key features that we would want if there came a day when we would pull the trigger on a car like that. Little did I know that she wasn’t just making small talk – she was taking notes, plotting an incredible surprise. In August 2017, I was in Maine testing the 707-horsepower Jeep Grand Cherokee Trackhawk and when I flew home, my wife was waiting to pick me up in our truck. As we drove home, she made the usually post-road trip small talk, but at some point, we made an odd turn away from home. She told me that she had to speak with her aunt, who works at a local Dodge dealership. As we pulled into the dealership, there was a 2017 Dodge Challenger SRT Hellcat in Go Mango parked out front. She said “do you like that car?” I replied with “of course I like that car”, to which she replied “good – it is ours”. For months, she had been figuring out the numbers and planning to surprise me with a Hellcat Challenger when I returned home from a work trip. She knew that I would never make the move on getting one, but she knew how badly I wanted a modern Mopar muscle car, so she had saved up the necessary money to make it happen. My 2017 Dodge Challenger SRT Hellcat has black leather interior, the premium Harmon Kardon sound system and the 8-speed automatic transmission. My only modification of sorts so far as the Z Automotive BurnBox, which incorporates the unique lightshow system (you can see it in the video below) along with Line Lock and Cool Down mode – similar systems to what the new Demon offers. I have some more upgrades planned for this spring including better tires, but right now, I have no plans to make any major changes. Even though the Challenger went into storage in mid-December to avoid the salt and potholes of winter in Michigan, the few months of driving my Hellcat before the snow fell were fantastic. The interior is luxury-level and with 707 horsepower on tap, there aren’t many cars on the road that will keep up. Anyone who likes to get ahead of the other guy at a stoplight will understand that the ability to out-sprint almost anything you come across never gets old. I can’t wait to hit some of the big shows this summer, such as Roadkill (if it happens) and the Woodward Dream Cruise, and I know that many of you reading this will be out there cruising with me. At this point in the article, I generally congratulate the winner, but this month, I will instead thank the people who nominated me, the people who voted for me and, of course, my beautiful wife for making it all possible. If you own a Hellcat Challenger, a Hellcat Charger, a new Dodge Demon or Jeep Trackhawwk, and you want to get involved, click here to join the Hellcat Group Facebook page! What a wonderful wife you have. I know having your significant other supporting your dream of Hellcat ownership is a wonderful thing. My girl is insistent we will never get rid of our Hellcat because she knows how much joy that car brings to me.